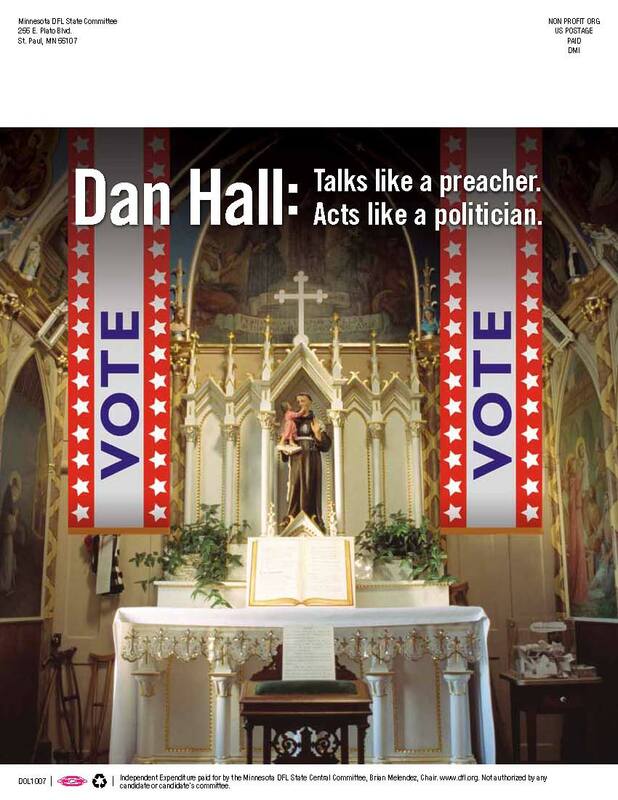 The ad is part of a two-piece mailing that highlights and criticizes the policy views of Dan Hall, a preacher who is the Republican candidate for the Minnesota Senate. I enclose both sides of both pieces. I understand that some Republican bloggers have taken one image from the first piece, and claimed that the mail is somehow anti-Catholic. But the text explicitly criticizes Preacher Hall for distancing himself from policy views that have been taken by the Catholic Archdiocese, by the Lutheran Synod, and other leaders in Minnesotas faith community. 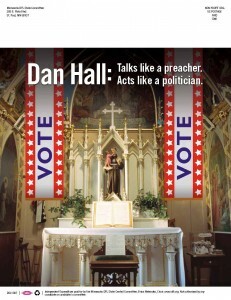 Dan Hall is willing to enlist God and religion in his campaign when it helps him -- but in fact, his views hurt the poorest and sickest among us, and this mailing holds him accountable for those views. You can see the second mailing here. It also refers to Hall as "Preacher Hall" (I can't find any evidence that Hall refers to himself that way). Why the DFL would use the image of a man in a Roman collar to depict a lay chaplain who is a member of a nondenominational church remains mysterious. At least we can dispense with the claims that the mailing is anti-Catholic, although it may be anti-wise. My apologies for jumping to conclusions.Another update: "I've never worn a Roman collar," Dan Hall told me. "No one in my church does." Asked why he thought the DFL would use such an image, he said, "I have no idea. You're offending all kinds of church people, whether Catholic, Protestant, or Jewish." Hall explained that, probably as a result of this dustup, he's received a great deal of media requests, concluding, "In the end, it's probably going to help me. 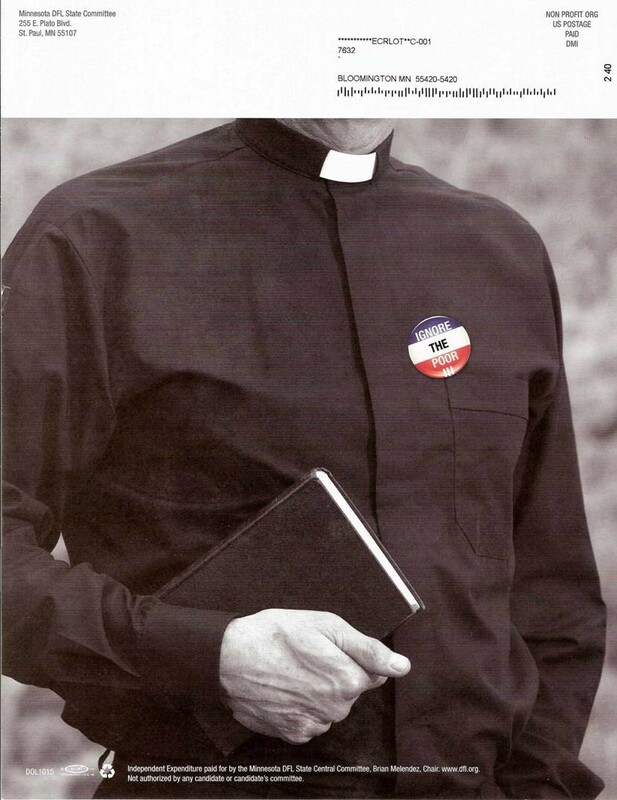 "Still another update (the last, I hope): That isn't the only Catholic-looking image the DFL is using in its campaign mailers. Check this one out. What is that, a side chapel? And St. Anthony? Might be a good time for the DFL to say a little prayer to him. Maybe he can help them find their common sense.